This week guest blogger Jildou shares her first ever Plastic-Free Tuesday. Would you also like to share your plastic-free experiences here? Please send an email to info@plasticfreetuesday.com. When I read about Plastic-Free Tuesday on my friend’s Facebook one evening not so long ago, I was immediately enthusiastic. Although I must confess that I’m always up for this sort of bottom-up positive initiatives, for example; I’ve tried post-crossing (which I can recommend everybody (Google it! )), I must also admit that when my friend contacted me a while later and asked me if I wanted write about my Plastic-Free Tuesday experience for this blog, I was at first a little hesitant. What would I write about? I mean, going a day using as little plastic as possible would be a piece of cake, right? Reading Marlies’ story was already an eyeopener regarding all the non food related plastics used on a daily basis so I decided I would just focus on using as little food related plastics as possible. As it turned out, plastic free breakfast and dinner were quite easy and both incredibly delicious. Lunch and snacks without plastic proved to be more of a challenge. What I really liked experiencing was that, in really focussing on not using plastic at all, I got a good look at everything I am consuming and throwing in the waste bin each day, and yes many things are wrapped in plastic! All in all, I have seen groceries and food from a complete different perspective. And in doing so, have become aware of some important things! I’ll tell you about it later, first I will describe my Tuesday. My Tuesday starts at 7:30 am with an alarm clock and a full day of work ahead of me. As my priorities focus mainly on my warm bed and remaining in it as long as possible, breakfast is usually hurried and to-go. Today however, I managed to get myself up a little early and have breakfast with my boyfriend. Mainly, to plan this special day and make this photo. Conveniently, my boyfriend bakes his own bread. A perfect opportunity to go without the plastic bag in which store-bought bread is normally found. So no plastic there. However, in overanalysing the situation, I must confess that the yeast is packaged in plastic. But, as a normal size bread contains 4 grams of yeast, and we buy the yeast in 500 gram packages, the plastic waste is at least reduced considerably. So maybe a little plastic there, but overall, I’m doing great. 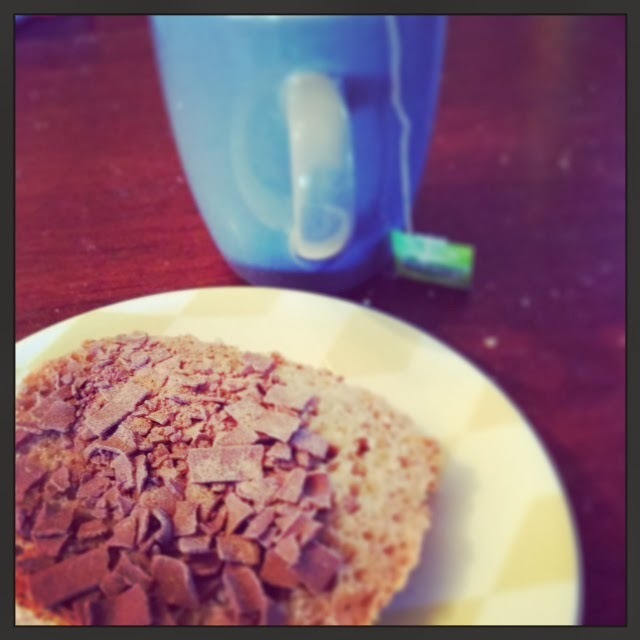 Tea is without plastic and so are the chocolate sprinkles (paper box). Good start of the plastic free day. Work. At work I usually drink tea. For every cup of tea I used to use a new teabag. When I was a student, I used to reuse my teabag, but somehow I forgot about that habit. Plastic free tuesday made me realise this again. Quick win. As a pre-lunch snack I ate a banana. It’s the only fruit we have at work that doesn’t come in plastic bags and thus kept my plastic score nice and low. At lunch time things became difficult. At work, on Tuesday, it is custom for my colleagues to have lunch together. As we have a lunch lady who goes shopping for lunch items almost every day, lunch is always very delicious with fresh bread, fruit and vegetables. There is also a large variety of things to put on the bread (chicken curry salad, all sort of meat, jam, chocolate sprinkles etc.). However, very few things don’t come in plastic. Even the cheese slices are wrapped individually. Basically only the chocolate sprinkles and jam come in plastic free packages. Since, from the enormous abundance of choices left for plastic-free-me, only chocolate sprinkles is something I can enjoy, lunch was not that good. I ate a few slices of bread and another banana. By 3 pm i was craving for something other than banana. And while I was seriously considering combing plastic packaged ham, cheese and ketchup and making myself a tosti, I decided to remain plastic free and I ate a knackebrod cracker with jam. Healthy for sure! But not my favourite. Not by a long shot. So if this plastic free tuesday is to become a plastic free week/month/year, some preparation will be necessary to get the lunch I like without the plastic I don’t. Dinner was a lot of fun! Of course, first I got to go shopping. When you get out of work at 5:30 pm, there is no time to go to the market which would obviously be the first choice for plastic free shopping. But a supermarket would have to do for me. And maybe this would be, in it’s difficulty to keep my low plastic score, an enjoyable challenge. Which proved to so when I encountered ‘the carrot problem’. Which is basically me looking for a carrot not wrapped in plastic. 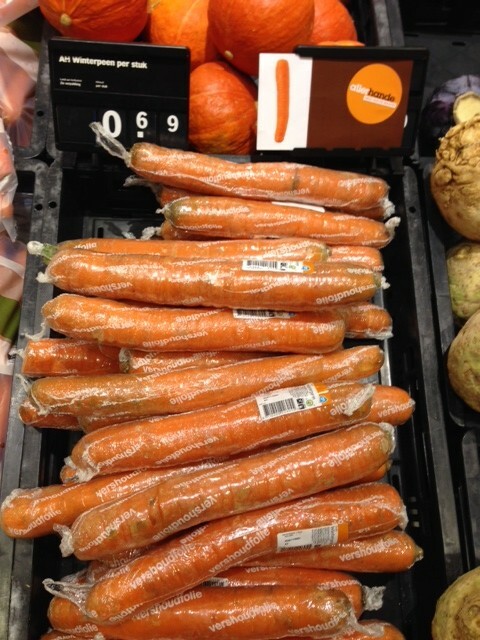 My local supermarket contained exactly zero plastic free carrots. So, I went to a different supermarket just to get my plastic free carrot (yes, by car, but only this one time to make a plastic statement). After this, I hurried home to prepare for diner. I like cooking, but on a week day I don’t want to be in the kitchen longer than 30 minutes. However, as I had a friend coming over, I had to prepare a proper diner. So, fast but good. I decided on risotto with carrots, beans and celeriac. Which is quite easy, delicious and a perfect winter dish. During diner we enjoyed a nice cool glass(!) of beer (which is probably why I forgot to take a picture). This finished my Tuesday. I have discovered that tea bags usually contain 20-30% polypropylene and so I have gone back to tea leaves with a metal tea pot strainer from Wittards. Hi June, thanks for your comment. I didn’t know that! Wow, it’s actually quite shocking. Fortunately I do have some loose tea so I should drink that more often. Hmm that makes sense actually.. considering that paper tea bags keep so well in hot water.. Thanks for sharing June! Another good reason to look into loose leaved tea soon. My main concern lately has been deplastifying coffee actually… which has proven somewhat of a challenge. But just got my own old fashioned grinder, so now on my way with coffee beans in bulk I guess. Hope it will work! What do you guys do for coffee, if you drink it? Thanks for sharing June! I had never thought about plastic in tea bags. I am not drinking tea or coffee at the moment. We’re moving too often. Marlies, what about the coffee? What’s your plan? Can you buy it in bulk? Hi! Well for coffee I now switched to my Italian percolator permanently actually (in one of my previous posts I still had a hard time saying goodbye to my machine :-), so that is a very clean process of brewing it, yet I still take the coffee grounded from a packet that I still have. Closer inspection of the ‘aluminium’ wrapper within the paper case suggests I am dealing with plastic in disguise there.. 🙁 So two options I think now: I buy ground coffee in bulk or beans in bulk which I grind myself. I’d like to try beans and grinding, just cause it seems fun. I already found this wonderful old coffee grinder at the Kingsday fleemarket (which I posted on the new Plastic-Free Tuesday Instagram account already! 🙂 and think I’ve found a few places to shop, but didnt have a jar on me last time. In the Netherlands Simon Lévelt shops are easy go-to’s I think (also for loose leave tea in bulk! ), but I am sure there are many other places to get coffee (beans) in bulk with the current coffee places hype :-). So trying it! If succeeded, I will post it here. Are each of those carrots individually wrapped in plastic? Crazy!